Predicted by Current and Past Prophets and Seers. "The great star for seven days shall burn / So nakedly clear like two suns appearing / The large dog all night howling / While the great Pontiff shall change his territory,"
When a great Pope changes his territory". - Signs Of The End Of The World as We Know it. Filmed in Mesa,az. August 2013 in evening looking south. Pardon his startled language. See more about the video in 'Contributing sources' below. I draw your attention to Malachi 4:1and 2. 1. Notice: The word Sun in Verse 2 is capitalized. Why is a word capitalized in the middle of a verse? It is a proper noun…a name. It is someone’s name, having to do with deity. 2. Notice: Verse one tells us that there is coming a day when the sun is going to burn those on the earth…with intense heat…like an oven. It is going to be a time of the execution of the wrath of God Almighty. 3. Jesus is often called the Son Of God all throughout Scripture. He is called the Only Begotten Son of God, due to the teaching that He is the only person ever born who was not conceived by man, but rather, conceived by God, Himself. He is called the Son of man. But here, in Malachi, He is not called the Son, but rather, the Sun. It is not a misprint. 4. Over in the Book of Revelation, when John the revelator saw Jesus, he said that the countenance of Jesus was shining like the sun: Revelation 1:16 And he had in his right hand seven stars: and out of his mouth went a sharp two-edged sword: and his countenance was as the sun shineth in his strength. This is revealed once in the last Book of the Old Testament, and once in the last book of the New Testament… Obviously, Jesus Christ is coming as the Sun at the end of time. 5. When Jesus, The SUN comes to this earth next, he will be shining as bright as the Sun. His countenance will be glistering white. And He will come with healing in his wings. This, of course, speaks of his restoration of this earth after the Tribulation period that immediately precedes His return to the earth. During the seven year period of the Tribulation, such horrendous annihilation will take place, that only Jesus can fix it. And fix it up, He will!" The word for "Sun" in Malachi 4:2 is word 8121 in Gesenius' Hebrew-Chaldee Lexicon to the Old Testament, and refers to the solar object. One of the things I've found in my study of the code I discovered and called "Alphabetics" is that words before and after a word in alphabetical sequence often shed prophetic and revelatory commentary on that word. In this case, the words before word 8121 have to do with "watch" and "watchmen". The words after have to do with transformation and "to be changed." Of course the connection between the idea of being a watchman and the Earth being burned is easy to see. What comes to mind for me in contemplating the relationship between the sun and the idea of being changed is that I have long believed that the events of the "second coming" would be a "baptism of fire", analogous to the "baptism of water" associated with Noah's flood. This will be a global phenomenon, and carry spiritual ramifications. The following information has been compiled from current and past prophets and seers, to further demonstrate how God almighty is warning humanity about the oncoming chastisement that is about to engulf the whole of Humanity. The first comes from a modern day seer, Gianna Talone Sullivan. One of her messages, which according to the information compiled about her, describes Our Lady's (Virgin Mary) message of warning for humanity. One of these celestial signs that would be given would be the sign of two suns, after which, major cataclysmic changes would ensue. The second source comes from the 500 year old Prophecies of Nostradamus. In these quatrains that I took from century II, also describes the appearance of these two suns, after which major wars, famines, pestilences, and destruction would ensue. Also recall that during the final sign that was given during the Fatima apparitions, the miracle of the sun, is the miracle that was associated with this final and miraculous apparition. Seems, as if humanity is on the verge of a major major chastisement! When a great Pope changes his territory. For those of you whove been following and supporting our work at yowusa.com over the years, this is the video youve been waiting for. 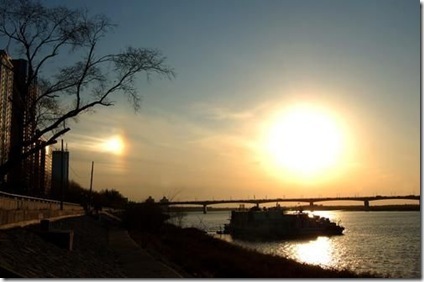 Two Suns. 110 likes · 1 talking about this. J. Davidson. This is the ABC Primetime investigative report that everyone must see for themselves. It's about 6 minutes in length and well worth your time. All studies can be reviewed by going to the website of the US National Library of Medicine at www.pubmed.gov and typing in "Protandim" in the search field. We are looking for distributors to join our group to help us get the word out about Protandim. We offer fantastic training and support, and quite frankly we are having a blast! Latest News: Survive the End Times Click Here! We do not know who this guy really is.